Based on the 1907 novel, “Israel Rank: The Autobiography of a Criminal” (which was also the basis for the highly regarded Alex Guinness film, Kind Hearts and Coronets, from 1949), A Gentleman’s Guide to Love and Murder is one of the most entertaining shows to hit Broadway in the past decade. The story of – you guessed it, love and murder – follows a lower class man named Montague Navarro (Blake Price), who discovers his royal lineage shortly after the passing of his mother. Family friend Miss Shingle (Kristen Antoinette Kane) tells him that he is, “the son of the daughter, of the grandson, of the nephew, of the second Earl of Highhurst.” Monty could very well be the next Earl, except for the fact that eight of the D’Ysquith family members (all played by the fantastic James Taylor Odom) stand in his way. After sending a letter to the family, and receiving a quick rejection, he comes up with a plan to kill off each relative who stands between him and his newly desired station. The show, with book and lyrics by Robert L. Freedman, and music and lyrics by Steven Lutvak, is full of catchy and downright hilarious songs. Numbers like, “I Don’t Know What I’d Do,” “Better With a Man,” and “I Don’t Understand the Poor” have the audience roaring with laughter. 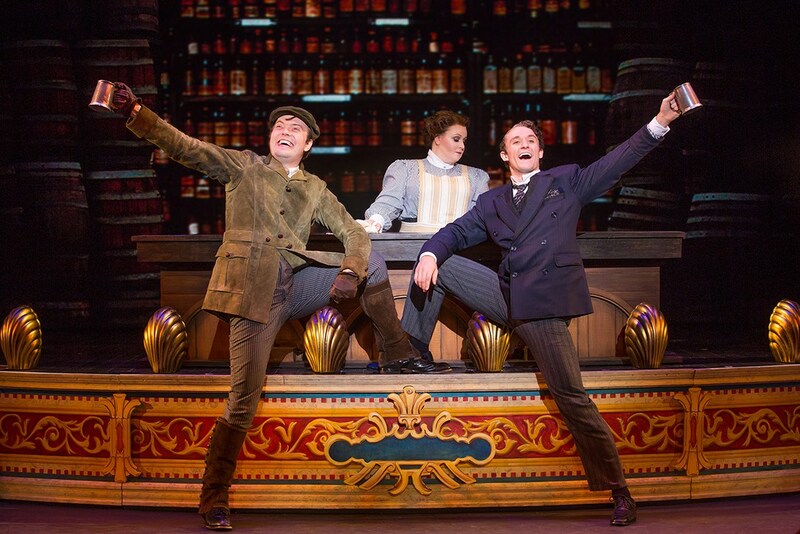 And one of my personal favorites is “I’ve Decided to Marry You,” which was performed on the 2014 Tonys the year that Gentleman’s Guide took home three of the awards. You can watch the delightful performance below. The nine members of the D’Ysquith family steal the show, played by only two actors in the show. Blake Price is charming as Monty, capturing the charisma needed to portray a character planning eight murders and that you want to root for. It doesn’t hurt that the other eight D’Ysquiths are played by the tremendously talented James Taylor Odom. The two of them are brilliant together on-stage, as Monty interacts with his newly found family tree. Odom has the challenge of playing: Asquith D’Ysquith, Sr. and Jr., Reverend Ezekial D’Ysquith, Henry D’Ysquith, Lady Hyacinth D’Ysquith, Major Bartholomew D’Ysquith, Lady Salome D’Ysquith Pumphrey, and finally Lord Adalbert D’Ysquith – Eighth Earl of Highhurst. Freedman has written a terrific group of characters, and Odom’s portrayal is nothing less than masterful. Monty’s love interest early on in the show is Sibella Hallward, played by the delightful Colleen McLaughlin. Sibella treats Monty as more of a plaything than a lover, singing that she doesn’t know what she’d do without him – and preparing for a date with a rich suitor at the same time. Yet her character doesn’t know what she has until it is too late, eventually married while Monty climbs the ranks of the family business. As Monty’s Earldom comes into focus, Sibella starts giving him more and more attention – eventually becoming jealous of Phoebe D’Ysquith (Erin McIntyre). Both of these women have beautiful voices and a knack for comedic timing. As mentioned previously, their performance with Price is, for lack of a better term, to die for. The production makes great use of an intimate set, wonderfully designed and donning a video backdrop that is cleverly used as a character throughout the show. Darko Tresnjak was responsible for the original direction which won Gentleman’s Guide the Tony for Best Musical. On the tour, Peggy Hickey receives credit for both direction and choreography – which are wonderful. The show is extremely funny – but is also clearly taken seriously. And that is how the best comedy is created. Everything from the dance numbers to the fabulous costumes is well crafted, making for a highly entertaining evening. 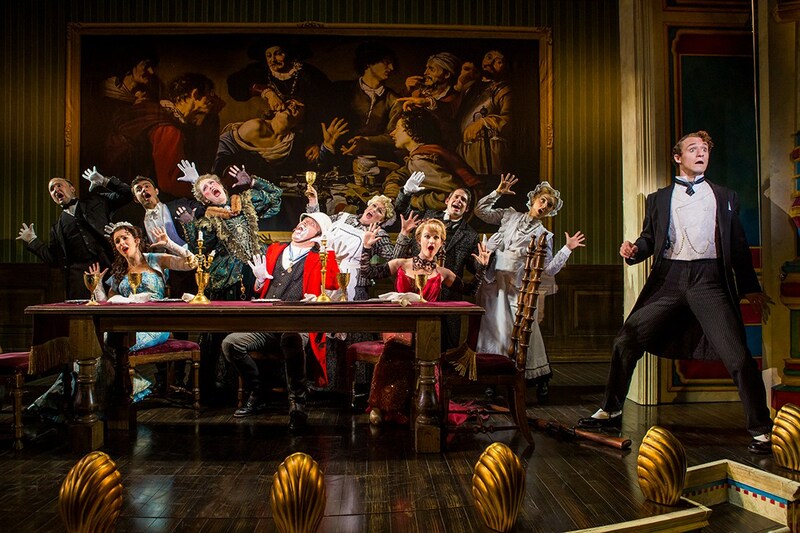 A Gentleman’s Guide to Love and Murder has become one of my favorite comedies, and one that I look forward to seeing any time it comes to town. Don’t miss the chance to see this hilariously clever musical if you can. It’s one that you won’t soon forget.